The Moscow metro is relatively safe, but pickpockets, thieves and drunken travellers can darken an unwary passenger’s mood. However, you can avoid incidents like these by following some simple rules. According to statistics from the Directorate of Internal Affairs, 290 robberies took place on the Moscow metro in the first 10 months of 2013. Only 182 of these were solved. For a thief the most important thing is surprise, so they can grab a bag, mobile phone or tablet in the last second before the metro door closes, jump out of the train and get away. Experts advise that you don’t stand close to the doors, sit in the middle of the carriage, hold onto your belongings when the doors are open and never fall asleep while traveling. Furthermore with the advent of video cameras, life has become much more complicated for a snatcher on the metro, you are now more likely to encounter robbers. Robbers on the metro normally operate quickly and typically have their own places of work – stations with a high volume of passengers. Pickpockets work in pairs, transferring the loot between themselves so it is very difficult to catch them with the loot in their possession. In 2013 there were 1,550 thefts on the metro, and 308 people were arrested. It is difficult to pick out a thief in a crowd: they are dressed normally and could be as young as 15 and as old as 70. They could be men or women. The most reliable sign, say the specialists, is a shifty look. Be particularly aware at metro stations close to mainline stations, such as Komsomolskaya, Kurskaya, Paveletskaya, Belorusskaya, or Kievskaya, and at large junction stations such as Biblioteka im. Lenina and at terminus stations. 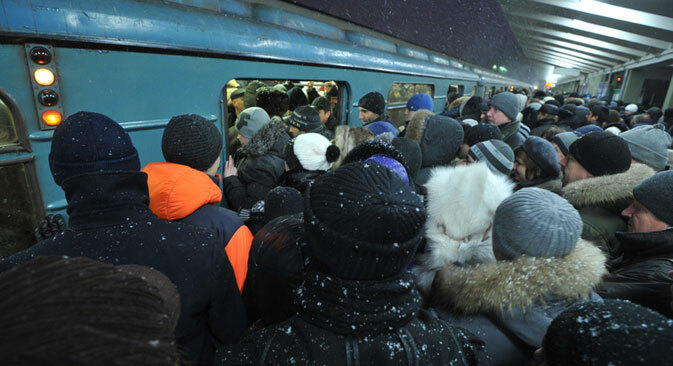 “Pickpockets usually operate during the rush-hour, when it is quite difficult to track and arrest them,” said Aleksandr Lipatov, the deputy chief of police on the Moscow metro. Don’t forget: it is not worth sitting in an empty carriage. You could find yourself in company that you don’t want to mix with. These are rare but nevertheless they do happen. If you fall onto the rails, don’t be alarmed. Don’t try to climb onto the platform, as this is where the live rail is. Walk in the direction of travel to a white triangle at the foot of the platform where the train stops, there is usually a ramp at that point. If you are not able to reach the white triangle before the train comes, lie down between the rails immediately, pulling the folds of your clothes tightly towards you. Moscow metro staff is on hand at every station as well as duty police officers to whom you can turn if anything untoward happens. In terms of response, police on the Moscow metro have become more responsive, however bureaucratic procedures could take several hours.